Wallace takes the reader on a wild ride of wrestling, mummies, and absurd action comedy. I've tried to figure out a way I could write about professional wrestling for Nerds of a Feather while maintaining the genre focus of this blog. I didn't come up with anything, though I deeply admired Matt Wallace's Tor.com essay on storytelling using a match between Bret Hart and Roddy Piper. I just didn't have an angle I could dig into. Bray Wyatt has been doing less quasi-supernatural stuff these days and The Undertaker is all but retired after his Wrestlemania loss to Roman Reigns. Then, I discovered Rencor: Life in Grudge City. It combines lucha libre wrestling with a sort of crossed purposes buddy cop story. There's also a possible tie in to the supernatural, maybe. That part is less certain. What is certain is that Rencor is a high energy dive into a lucha culture where the tecnicos (the good guy wrestlers) have worked with police for generations to solve supernatural crimes that are too much for regular beat cops and are in a constant blood feud with the rudos (bad guy wrestlers). Wallace reunites a legendary rudo long banished from Cuidad Rencor with the heroic tecnico who conquered him. Their enmity spans generations and runs deeper than simple "good guy versus bad guy", this is about their deepest core of who they are as men and as wrestlers. Being a rudo or a tecnico is a way of life, not a character they put on when the wrestler steps into the ring. So far we've only discussed, in very general terms, the wrestling aspect of Rencor. It is, after all, what brought me to this book. But - knowledge, appreciation, or understanding of professional wrestling is not required to read Rencor. The heart of the novella is the buddy cop story where the buddies hate each other with a passion matched only perhaps by the Hatfields and the McCoys at the height of their blood feud. El Victor and El Mil Calaveras are brought together by the Rencor police department to solve a museum robbery that resulted in reports of mummies wandering the streets of Ciudad Rencor. It’s set in a modern world, but it’s also a throwback to the heyday of 70’s cop shows and Mexican B-monster movies starring legendary enmascarados. It also explores what it is to be a pro-wrestler, the business itself, and the culture surrounding it. It’s got great action, great humor, great heroes and villains, but it’s also about the masked hero of myth dealing with a very real world that’s constantly evolving. Looking at it from the outside, Wallace does lucha culture proud and with great respect. In doing so, Wallace takes the reader on a wild ride of wrestling, mummies, and absurd action comedy. Folks, Rencor: Life in Grudge City is a blast. 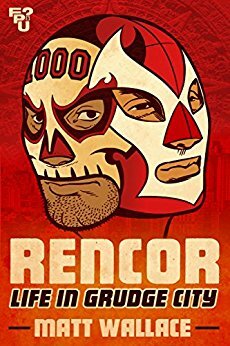 Like Wallace's Sin du Jour novellas, Rencor is funny without being a straight up comedy and chock full of energy and drama. Bonuses: +1 for bringing professional wrestling into a story in a way that feels natural for both the wrestling and the mystery. Penalties: -1 The museum robbery is almost besides the point, even though it's technically the main driver of the story. Nerd Coefficient: 8/10, "well worth your time and attention". See more about our scoring system here.